Believe it or not, the Florida Gators on Wednesday closed with a top 10 recruiting class for the first time since 2014. 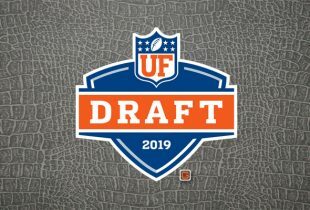 When you consider the prestige of Gators football and the quality of players Florida has produced over the years, that is astounding. Still, credit head coach Dan Mullen for righting the ship in another area of the program that began to sink. 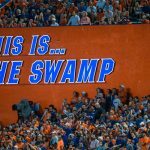 With 2019 National Signing Day now in the books, UF checked in with the No. 9 overall class in the nation. The Gators went from No. 21 before the Early Signing Period in December 2018 to No. 11 entering the day and moved up two spots after adding the two primary prospects they were looking to sign — four-star top 100 recruits in defensive back Kaiir Elam (North Palm Beach, FL) and defensive end Khris Bogle (Fort Lauderdale, FL). Just moments after Elam’s announcement in the mid-afternoon, Mullen took the podium to address the class he signed and what’s ahead for Florida. As Mullen spoke for a full hour, we truncated his comments and singled out some of the hottest topics he touched on during his availability. On the overall recruiting success: “A really great day for us when you look at some of the additions we had today are huge for us, huge for the future, big pieces for the future of how we continue to build this program. And not just in guys on the field but the character of guys off the field. … As guys talk about what a family program we have and how the families are very involved in the decision, I’m really excited about that because I think that when you look and a lot of the stuff that goes on in recruiting, parents come up here and see what our program’s about, how their sons are going to be treated and taken care of, treated as part of our family, but also see beyond the field at the University of Florida and what the University of Florida means to them. 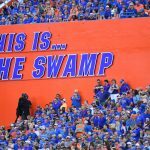 Not just about playing football on Saturdays in The Swamp, but the education that you’re going to get, which is the best education in the Southeastern Conference, with the alumni base, with the connections, the networking that it’s going to give you for your future beyond football is so special. On whether he was concerned about getting Arjei Henderson’s signature: “Well, until the papers come through, you’re always checking on things. But Arjei is a guy that we recruited early, had shown interest early, had committed elsewhere, and but we would always stay in contact with. I think one of the things that he wanted, that helped is him getting around some of our players at the all-star game and communicating and talking to those guys. 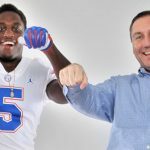 And he really came out and came out strong and said, ‘Coach, I really want to commit to Florida.’ And I’m like, ‘OK,’ but having — he committed places [before], I kind of went through more the why. And he’s a guy that jumped. On what four-star DB Chris Steele brings to the class: “Chris has done a really good job since he’s been here, and especially with the opportunity to enroll early for him, [he] is going to get him invaluable experience. When you look, especially with Marco [Wilson] still going to be coming back in spring, and not 100 percent, he’s going to have an opportunity to very much run with the ones. And if you look at last spring, with Trey Dean coming in and getting reps with the twos and getting a lot of reps with the ones during spring ball, if you would have asked me this time last year, ‘Do you think Trey Dean’s going to start 10 games or 11 games for you as a true freshman at the corner position?’ Probably would have said, ‘Boy, that would be a stretch for us.’ But the opportunity he would have would be there for him to get that experience and get ready to go play.